The hottest known exoplanet is so hot that its atmosphere is "boiling off" and the escaping gas is being captured by its nearby host star, a new study shows. The hot Jupiter-like planet, known as KELT-9b, was first discovered in 2017 orbiting an extremely hot star called KELT-9. With temperatures as high as 17,540 degrees Fahrenheit (9,726 Celsius), this star is bigger and hotter than the sun, according to a statement from the Max Planck Institute for Astronomy in Heidelberg, Germany. "This planet reminds me of the mythical Icarus, who came to close to the sun and crashed," Thomas Henning, co-author of the study and director at the Max Planck Institute for Astronomy, said in the statement. "Our planet will not crash, but it will certainly lose an essential part of itself, namely its atmosphere." KELT-9b is considered a "hot Jupiter" exoplanet, possessing almost three times Jupiter's mass and almost twice Jupiter's diameter. 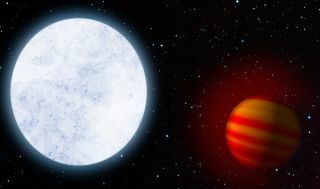 It was first discovered by researchers using the Kilodegree Extremely Little Telescope (KELT) at Winer Observatory in southeastern Arizona, which detects dips in a star's brightness and, in turn, suggests an exoplanet crossed in front of the star. Using the CARMENES instrument at Calar Alto Observatory in Spain, the new study found that KELT-9b has a surprisingly large extended hydrogen atmosphere. This suggests that the planet's host star is not only heating up the planet's hydrogen atmosphere, but is also using its gravity to pull the hydrogen onto itself, according to the statement. Based on the size of the planet's extended atmosphere, the researchers estimate "that the planet is losing hydrogen gas at a significant rate of more than 100,000 tons of hydrogen per second," according to the statement. "The star is 'boiling off' the planet's atmosphere, and pulling the gas onto itself, in a blatant case of interplanetary theft." Their findings were published July 2 in the journal Nature Astronomy.